We are learning more and more about the benefits of fermented foods, the importance of probiotics in our diet. The lactic acid in fermented food strengthens the immune system and aids digestion. We know we eat better when we stick to seasonal produce and buy what comes from nearby. Supermarket strawberries and tomatoes don’t belong to our winter tables. Apples and pears are at their best, broccoli, kale and Brussels sprouts are at peaks, and the forlorn cabbage, inexpensive and nourishing, is there for the taking. I wish I had one of my grandmother’s gray stoneware crocks, and I hope whoever has them keeps them in use. In fact I have no crock, but I still ferment kraut every fall in a gallon Cambro plastic container. Enough kraut for 4-5 meals takes around half an hour to prepare and costs under $2. A Best Buy if ever there was one! Don’t be afraid to try it. People have been souring cabbage for thousands of years. It’s a natural process and just takes some time. The only things to be diligent about are: first, to make sure your fermenting container is scrupulously clean, and, second, that you let your kraut cure slowly in a place that isn’t too warm. A cool garage or basement is just right. The good bacteria that turn cabbage into kraut are living organisms (like yeast) so they don’t flourish if they get either too hot or too cold. Take that cabbage, shred it, salt it, mix it, pack it down, weight it, cover it, and leave it alone while nature’s little helpers create your winter treat. Wash and scald a gallon container, a crock, a narrow plastic canister or a heavy glass jar. Drain to air-dry. 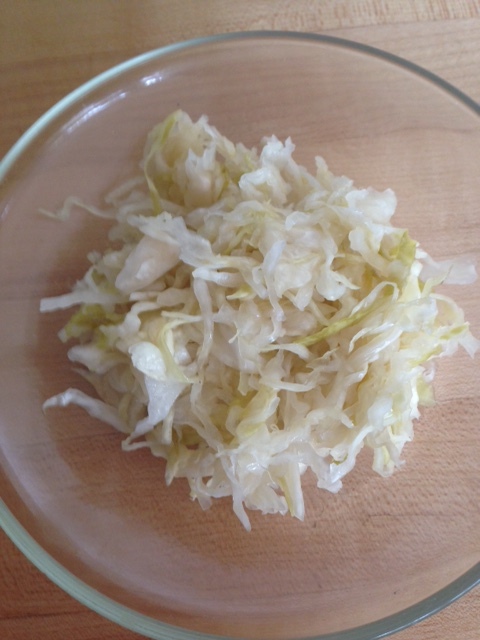 Using a large chef’s knife, cut the cabbage into quarters. Slice the core from each quarter. Shred the cabbage into the largest bowl you have. Use a sharp knife, a mandolin or a cabbage cutter for the shredding. Sprinkle over the salt and using your ultraclean hands, mix and knead the salt into the cabbage. 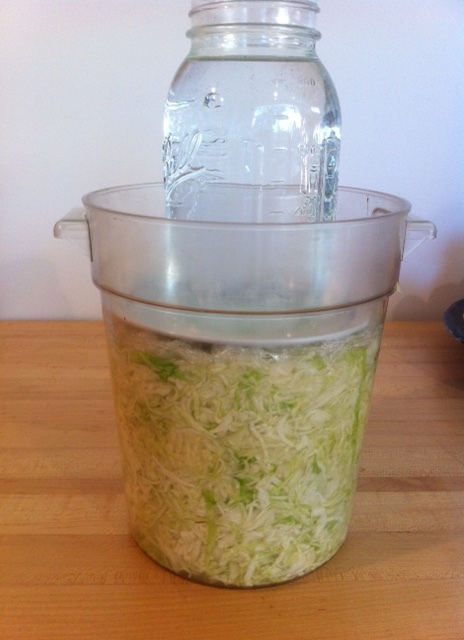 Once the juice begins to exude, pack the salted cabbage by handfuls into the clean crock or other container. Using your fists press the cabbage down until a layer of water floats on the top. Cover the wet cabbage with a square of clean plastic wrap making sure the wrap comes to the edges of the container sides. Place a saucer that will just fit into the cylindrical opening on top of the wrap. Add a heavy weight to the saucer to keep the cabbage juiced. For a weight you could us a quart jar filled with water, a clean rock, a stone mortar, or a couple large cans of tomatoes. Store the kraut in process in a cool place, darkish if possible. Check from time to time to make sure there are no off-odors (though at a point in fermentation there will be a mustardy gas sort of smell, a bit like overcooked Brussels sprouts. That’s OK). Once the cabbage looks and tastes like sauerkraut, you may divide it into quart jars and store it in the fridge to use for the next several months. Please don’t let the winter pass without a crock of kraut. You are currently browsing the Mary Jo's Kitchen blog archives for October, 2015.